Cut up all potatoes and boil them in salted water. As the potatoes are boiling, use the garlic press on all cloves of garlic and cut up the green onions and dill. Set aside. 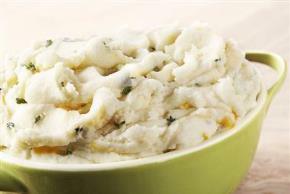 When potatoes are fully cooked, drain well and mash with butter. Add the sour cream. Mix well. Add in the green onions, dill, garlic, black pepper, sea salt and ground ginger. Enjoy!